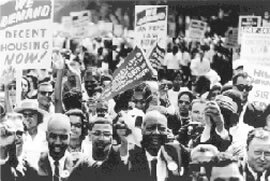 The March on Washington was organized by Randolph in 1963. Photo from PBS.org. Photo by Richard L. Copley. A. Phillip Randolph served as president of the Brotherhood of Sleeping Car Porters (BSCP). During the years when the railroads were the main form of long-distance transportation in the U.S. almost all the porters were African-American men. He was a strong civil rights activist and leader in the fight for economic justice for African- Americans. He organized the 250,000 -man March on Washington for Jobs and Freedom in 1963. As a participant in this mass protest, Dr. Martin Luther King made his famous "I Have a Dream" speech. The Civil Rights Act was signed the following year.